The ferry departs from the downtown terminal at Pier 52 and drops you off in the cute town of Winslow. If you choose to visit without a vehicle, the town’s main street, Winslow Way, is an easy walk from the ferry terminal and is full of tasting rooms, restaurants, cafes and shops. However, If you bring a vehicle (which is what I would recommend), you can explore more of the island and head out to additional wineries that aren’t within walking distance. 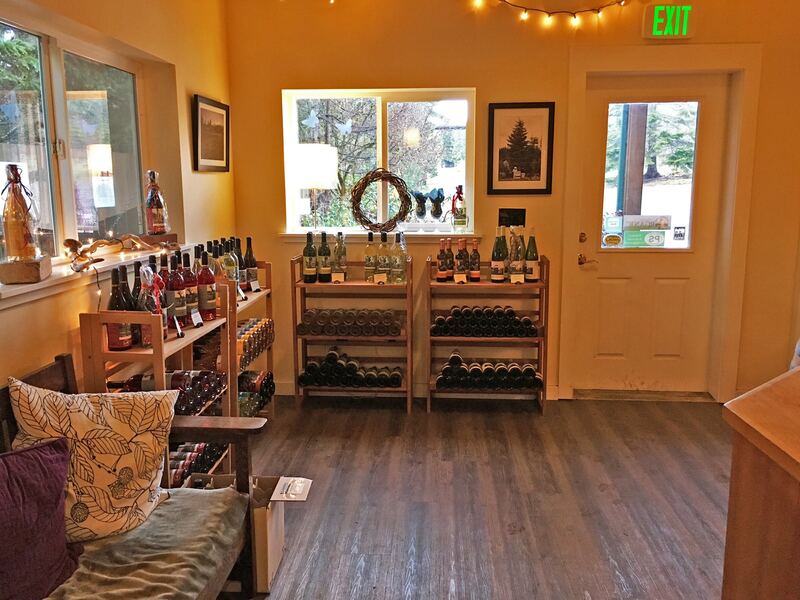 An easy 5 minute walk from the Ferry terminal, Island Vintners is the first tasting room you’ll encounter while walking down Winslow Way. 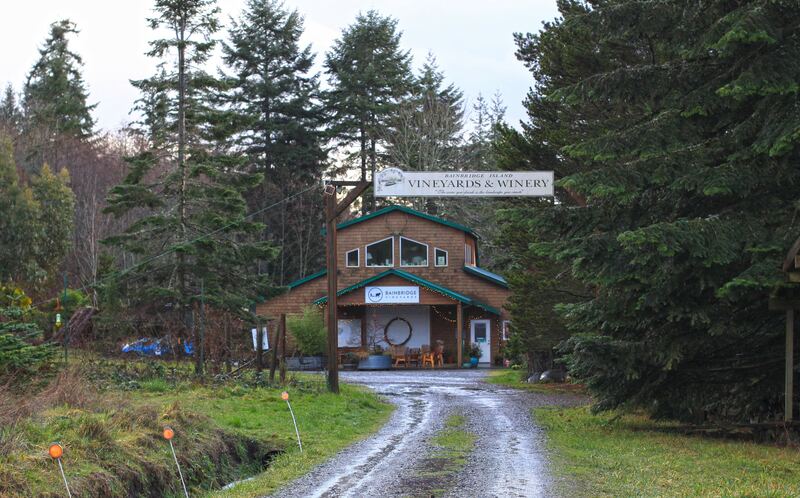 Island Vintners is a collaboration of 2 boutique wineries on Bainbridge: Amelia Wynn Winery and Fletcher Bay Winery. 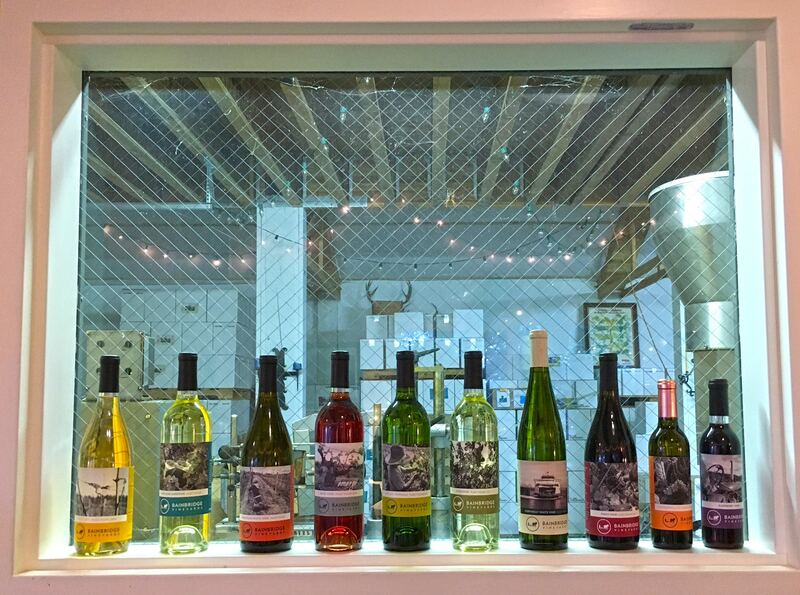 The majority of these artisanal, small-run batches of wine are only available in this tasting room. During my first visit I fell madly in love with the Amelia Wynn’s Aragon wine, and was devastated to learn (after much research) that it’s only available for purchase on the island. So, when I returned to the island last week, I was sure to stock up. Amelia Wynn Aragon is among my top 5 favorite wines. The winery is, in my opinion, one of Washington’s best kept secrets, and makes the best wine you’ve never heard of. They produce excellent Bordeaux, Rhone, and Northern Italian varietal wines. I cannot recommend their wine highly enough. Rolling Bay winery was my favorite stop of the day. 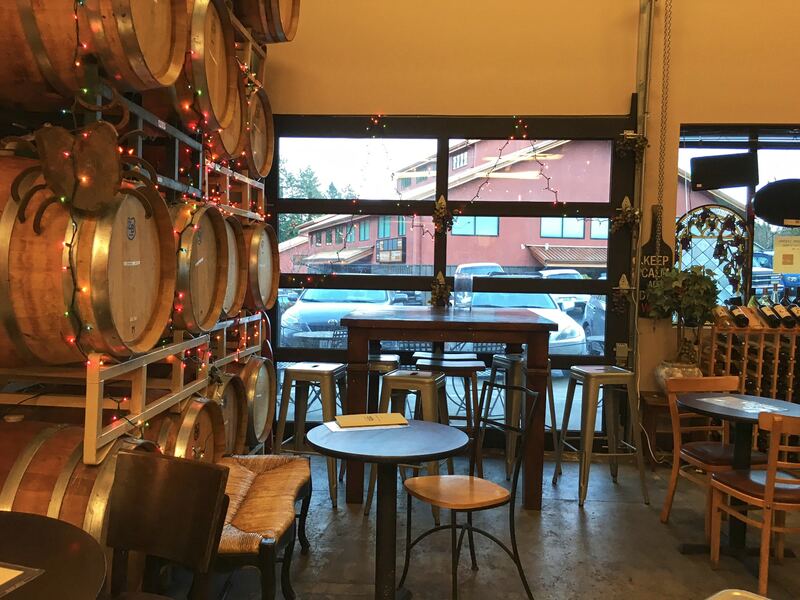 While the tasting room is fairly small (and can get pretty crammed), the owners and regulars are extremely welcoming and are quick to make you feel at home. The setting is gorgeous (tucked away off a back dirt road), and the wines are wonderful. Tasting was $5, and the owners set out cheese and crackers for you to enjoy with your wine. 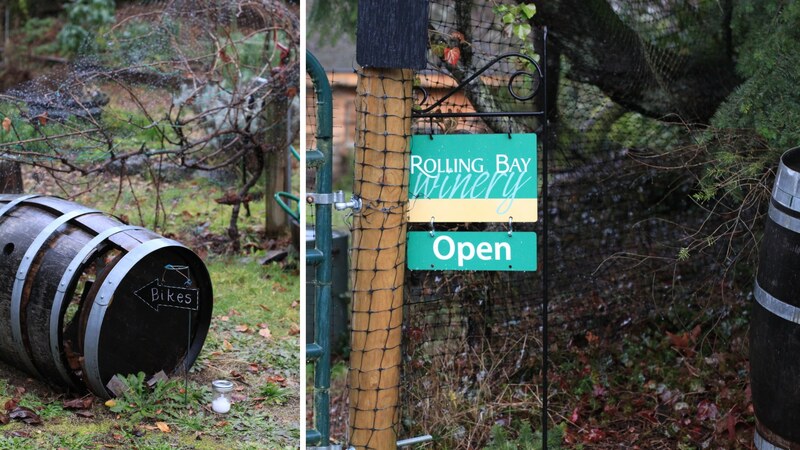 Rolling Bay winery definitely gets an A+ for atmosphere and overall experience. 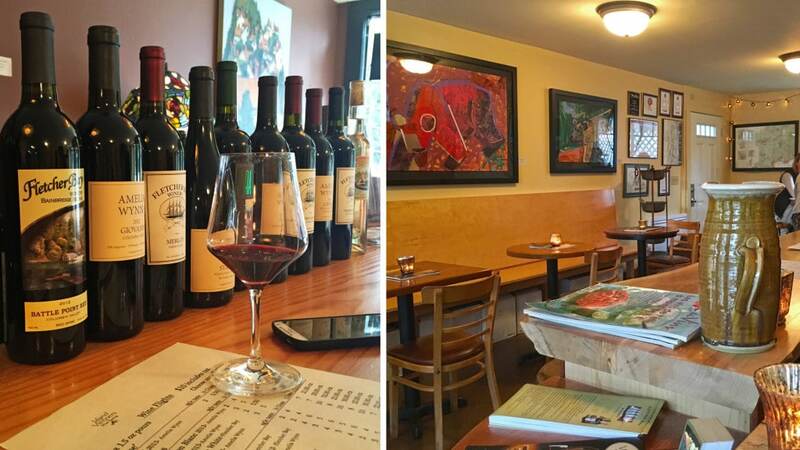 Beyond just offering exceptional wine, the owners/winemakers are extremely hospitable and wonderful hosts. 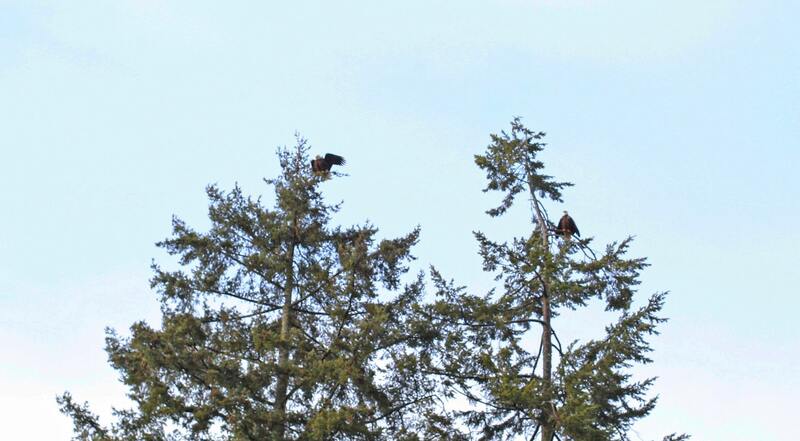 We were even lucky enough to see two bald Eagles hanging out in a tree near the property. I would highly recommend this winery to anyone visiting, and will definitely be back! 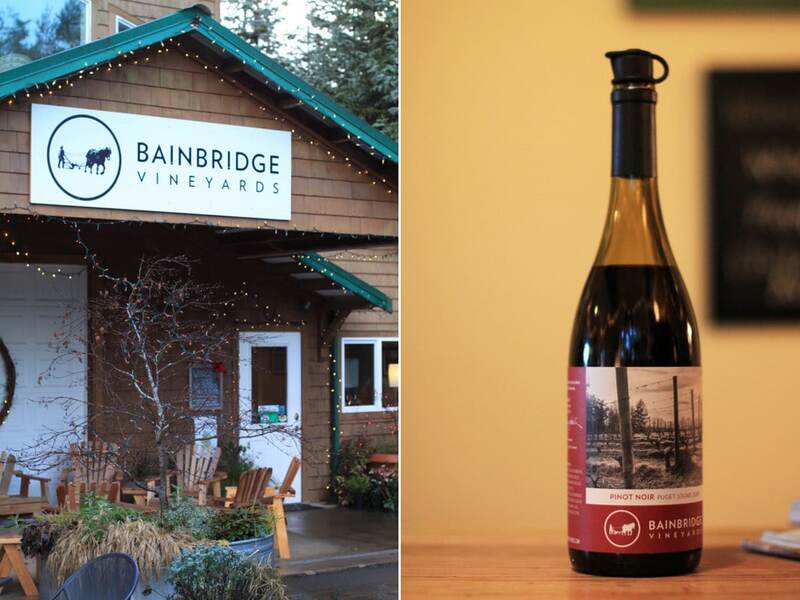 Besides being one of the oldest wineries in Washington, what sets Bainbridge Vineyards apart is that it’s one of the only vineyards on the island, and the only winery using 100% island grown grapes and fruit. The beautiful winery is located on seven acres of historic farmland, and the spacious tasting room includes windows into the wine production facility to give guests a “behind-the-scenes” glimpse. The winery focuses on rare varietals that thrive in the Puget Sound. 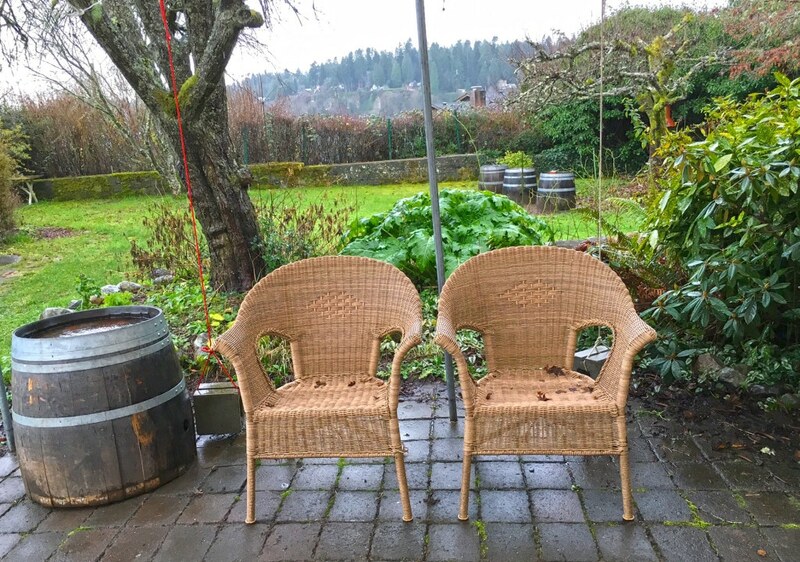 These cool climate grapes produce some unusual Washington wines, including Müller-Thurgau, Madeleine Angevine, and Siegerrebe. The flight costs $5 and includes mostly white wines, with the exception of one pinot noir. Fletcher Bay Winery is a small boutique winery owned by Jim Wilford. 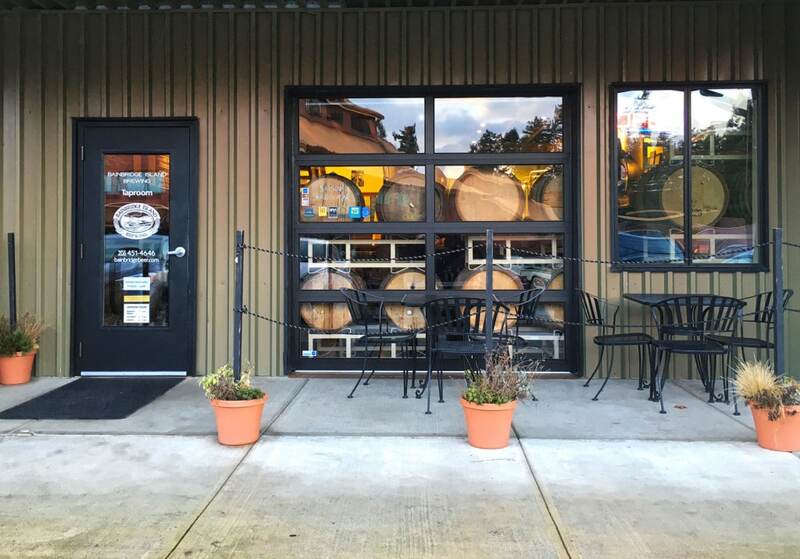 The winery is located in the middle of a nondescript strip mall away from downtown (yet right next door to a brewery and distillery if you’re in the mood to continue your tasting adventure beyond wine). The cozy tasting room seats guests among barrels of aging wine. Fletcher Bay specializes in rich, full-bodied red wines using grapes sourced from Columbia Valley, Walla Walla and the Yakima Valley. My favorite wine was the Cabernet, and I ended up taking home a bottle. I loved that they served food, after a day of wine tasting the cheese and crackers were heavenly! I also loved that the tasting fee was only $5 for six glasses of wine. During our visit, there was an older couple sitting at the bar adjacent from us. The man made his own wine (learning from Jim Wilford, Fletcher Bay’s owner), and let us taste some of the wines he had on-hand. I even ended up buying a bottle of Strawberry wine from him. Overall the service and wines were great, and I would definitely recommend paying a visit. I’ve been to Seattle several times but never Bainbridge even though I’ve heard good things- I’ll have to do it next visit! Thanks for the list that I can reference when I go! I had no idea there was wine tasting in Seattle! It looks like so much fun! I have lived in the Seattle area most of my life and have never done that tour. I think I have a new trip in my future! Pinning this post so I can do this! Thank you! Wow this is so great! I’m in Spokane, but this would be a really fun thing to do for a little mini getaway! Thank you for the post! I am hoping to get up to Washington soon, so I’ll definitely be saving this. I absolutely love this, thank you! My sister’s friends planned a “wine weekend” to Bainbridge and I was confused as to why we went to mostly beer places. I guess they didn’t know about all these gems! Oh my gosh! Your photos made me add this to my list of things I want to do before I’m 40. ☺️ Beautiful and sounds amazing! We are headed north in a few weeks for a vacation, and this post gives me lots of new ideas! Thank you! The last time I was in Seattle I did a craft distillery tour. Next time, I’ll definitely need to do a winery tour. Bainbridge Vineyards looks so perfect! I’ve never been to any of these places, but after reading this post, I would love to! I love Seattle! I can’t to go back there. Wine tasting in a perfect backdrop — what could be better than that? 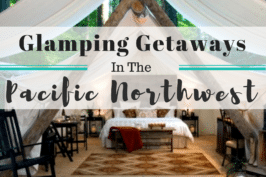 Haven’t spent much time in the Seattle area, but I need to bookmark this post for my next trip! I keep meaning to visit Bainbridge because I keep hearing how beautiful it is. I had no idea they even had wineries in that area! Looks like a great list of spots! That sounds really lovely. I love that area! 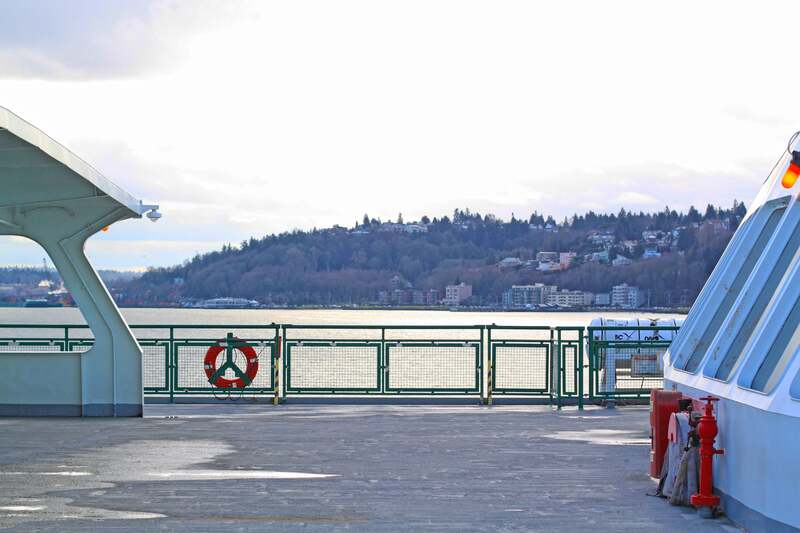 Anywhere you have to take a ferry to is way more special, right?? 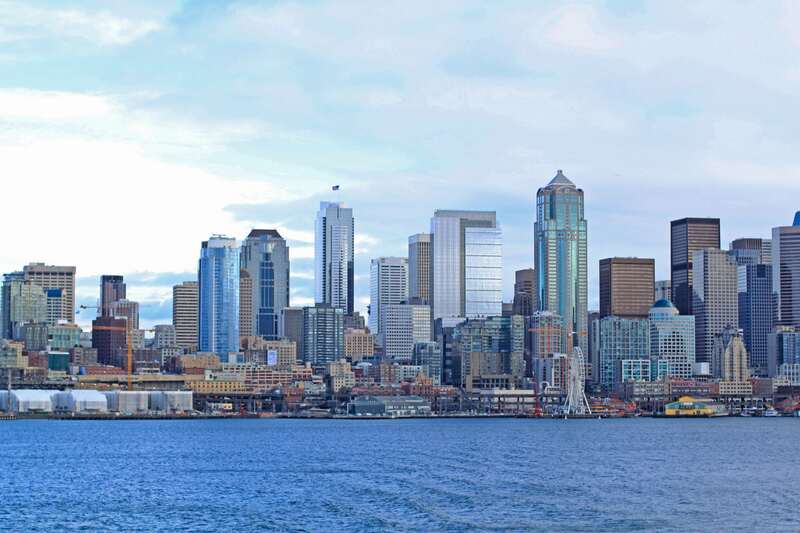 Seattle is high on my list of places to go! Looks so beautiful! 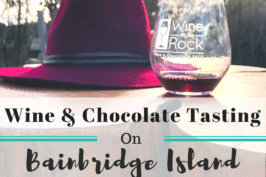 We are in the Bainbridge Island quite frequently (my in-laws live in Poulsbo) and we’ve never once gone wine tasting! Well…we’ll just have to change that! 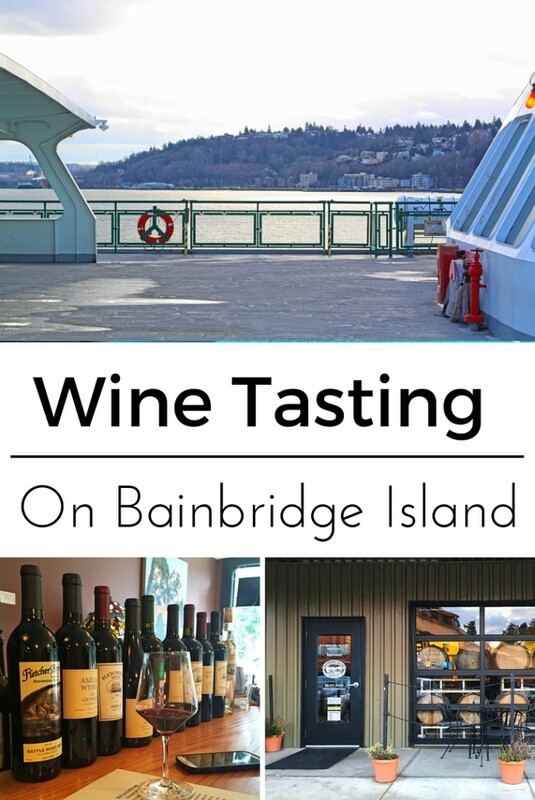 My brother in law used to live on Bainbridge and first introduced us to some of the wineries there. That was quite a few years ago. Looks like many more have opened tasting rooms. What a fun day trip for visitors to Seattle!! I really wanted to see Bainbridge Island last time I was visiting Seattle and I just didn’t have enough time in the two days i was there. 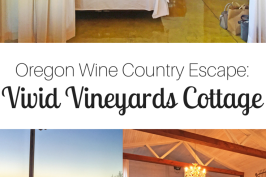 Definitely on my list for next time, I’ll have to stop by some of these wineries too! Sounds amazing. We have good wineries here in California but love to visit them up there! 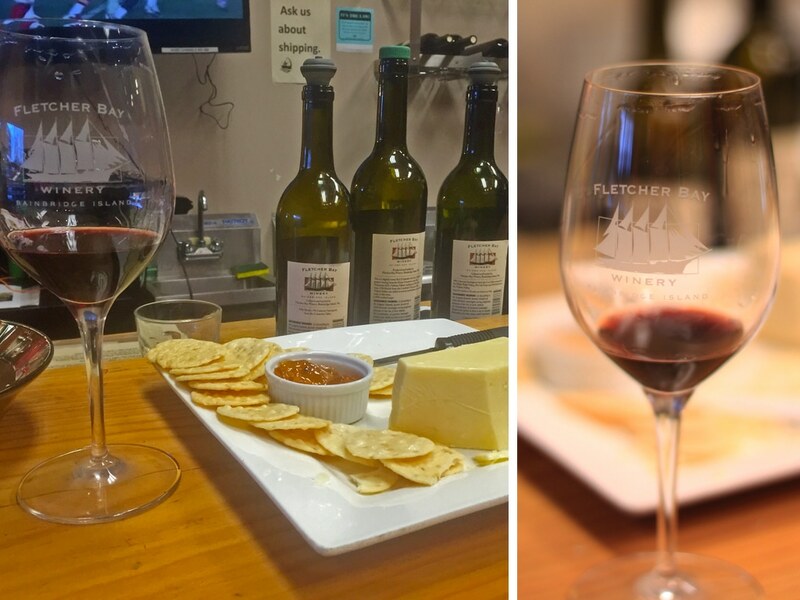 A ferry ride is always great, but add in a bunch of wine tasting and that sounds like the perfect day! 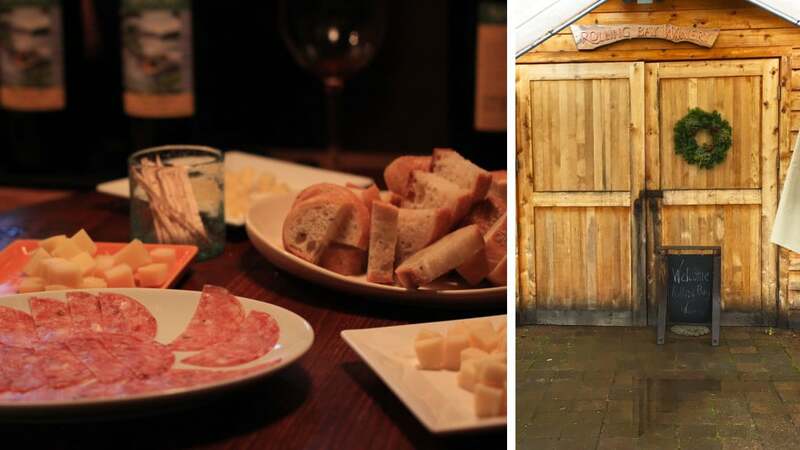 OH I totally want to go around to these wineries on my next visit to Seattle!